We have discovered a big problem! We are using resources faster than we can replace them! To understand the issue better, we watched videos about fossil fuels, energy consumption, pollution and greener solutions. Then we began to collect our own data. We audited energy use in our homes and at BISS, and oh dear, what a shock! We are wasting resources every day! We found lights on in unoccupied classrooms, air-conditioners set below 18 degrees, electrical devices drawing power when not in use and even leaky taps. But the thing that upset us most was that many classrooms in our school didn’t have paper recycling systems. So we are going to change that! We made new recycling bins, then taught a lesson to each class about how to separate their trash and why recycling is important. It was tricky to talk to the youngest students in Pre-K, but now they are our best recyclers! 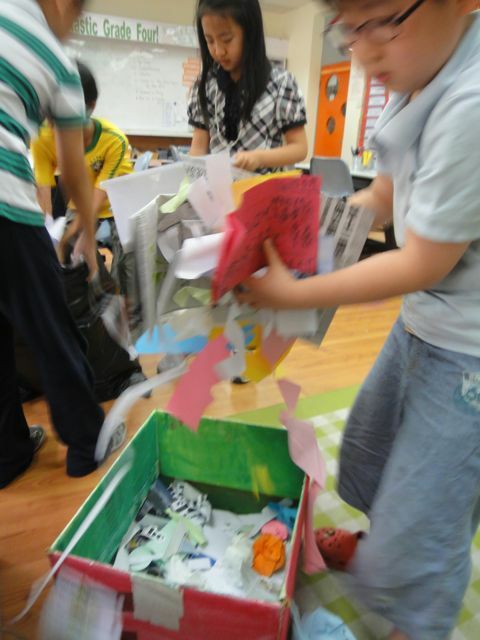 Each day, we are collecting the recyclable paper & card from the classrooms and storing it. We are noticing less waste and better sorting in the younger classes. In a few weeks, we will take all the materials to a recycling plant. This will save trees, electricity, water, chemicals and a lot of pollution. Why is it important to save trees? Why is recycling a helpful solution? How can people reduce paper use? I think recycling at BISS has made a change! At first, Grade 1 was putting wrong things into the recycling bin, such as dirty tissues. Now, they are only putting paper and card inside the recycling bin! And they know why trees are important because of an animal’s shelter and the earth’s oxygen. We know that if we don’t recycle, we cut more trees and we will put all the waste trash into landfill. I knew how trees are important in this unit. Now I will try to save paper at my home to by recycling it everyday. Thank you for letting us teach our school about recycling and letting us do a big job for it. I am enjoying it! I think saving trees is important because it gives us oxygen to breathe, it stops soil erosion and when we go camping, we use it to make fire. Also I am very excited to bring the recycled paper to the recycling center. When will we go to the recycling center? I think it is a good idea to use the recycle box to protect the environment. I like getting the paper every day. 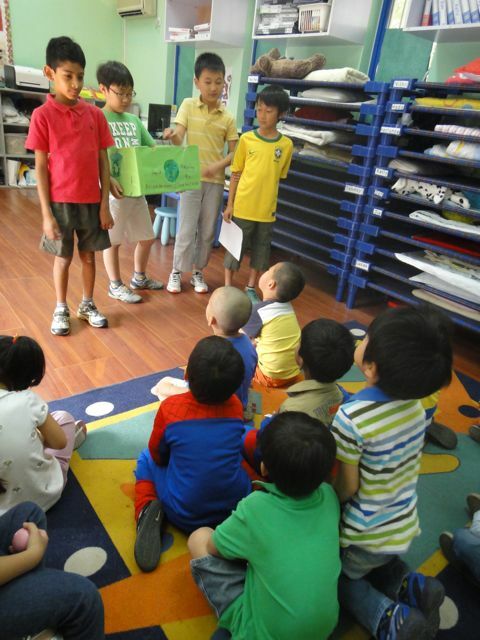 It is a good idea and our class is doing a good job at action. It was a great idea to recycle the papers in elementary classes. If we don’t have trees there will be no clean air on the Earth any more. But recycling is a good solution because we can use less harmful chemicals that make the air bad. So we can reduce paper by using both side and when we are sending mail use e-mail. Trees are very important to Earth so we need to recycle, reduce and reuse paper. I was very shocked when I learned that we are cutting 2000 trees every minute in Amazon alone! I think trees are very important, because it give us clean air, medicine, habitats for animals, jobs, material to make things and also, the trees’ roots stop the erosion. Let’s save the trees! The recycling paper project is very fun. Also, it is good for the Earth. We can’t save all the world’s trees but we can save at least two trees during this project. If we don’t save the trees there will be no fresh air on Earth. Can you imagine being in a world with no air, and every one in the hosbitle and so many germs? Do you want that? 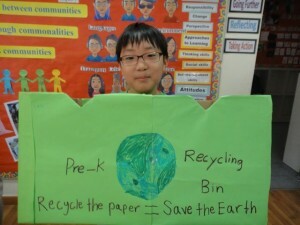 I learned 3 word in class that is Recycle, Reuse and Reduce. Those are all important for saving resources so everybody should start Recycling, Reusing and Reducing. Thank you for teaching us about finite resources. It was really fun to make the recycle bins. I also enjoyed explaining recycling to Kindergarten. They listened very well and asked many good questions so I was surprised and I felt like I wanted to explain to them even better. It is important to save the trees because they give us oxygen, animal habitats, medicine, shelter and sometimes foods. It was fun to make the recycle bins but it was very hard to explain to Pre-K what a recycle bin is and why we should save trees. Trees are important to us so they can make O2 for us and they can make many things for us so trees are very important. And recycling is a good thing to do because it can save trees by changing old paper to new paper and it can save energy by not making paper from new trees. And we also should reduce for example, changing font to a smaller size. So we should save trees! It is important to save trees because they provide half of the earth’s oxygen. We need trees because they also provide shelters for animals and they also provide medicine and foods. Recycling is a smart solution to this industry because recycling uses less energy, chemicals and water because it is making paper from recycled things so it doesn’t take a lot of energy in the process. People can reduce and reuse paper by using both the front and back.